Software Removal Tool is a helpful utility for users of the Google Chrome browser which can remove conflicting or dangerous addons. Issues can normally pop up when you've accidentally installed malware or other unwanted software on your PC. They may become noticeable when browser settings and customizations change, usually by way of third party software. 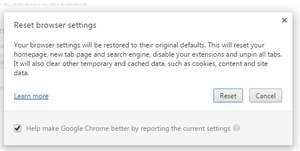 The Software Removal Tool from Google provides you with an easy way to quickly remove toolbars, search engine changes and addons which degrade browsing experience. Version 23.131.2 is a freeware program which does not have restrictions and it's free so it doesn't cost anything. For security reasons, you should also check out the Software Removal Tool download at LO4D.com which includes virus and malware tests. Additional screenshots of this application download may be available, too. 4 out of 5 based on 73 ratings. Software Removal Tool has a presence on social networks.